Hairy Morning Glory is a climbing undershrub, with hairy stem. Leaves are 13-20 x 7-14 cm, broadly ovate, base heart-shaped, tip abruptly tapering, densely bristly above, velvet-hairy beneath, nerves 7-13 pairs, prominent below. Leaf-stalks are 5-11 cm long, densely velvet-hairy. Flowers are borne in leaf axils, in few to many flowered cymes, bracts leafy, up to 3 cm long, lanceshaped, shortly stalked, persistent. Sepals are 6-8 x 2-3 mm, oblong, obtuse, sparsely hairy, equal. Flowers are 5-7 cm long, funnel-shaped, pale purple, hispid outside. Style is threadlike, stigma 2-globose. Berry is 8-12 mm across, depressed-globose, yellow. Seeds are embedded in mealy pulp. 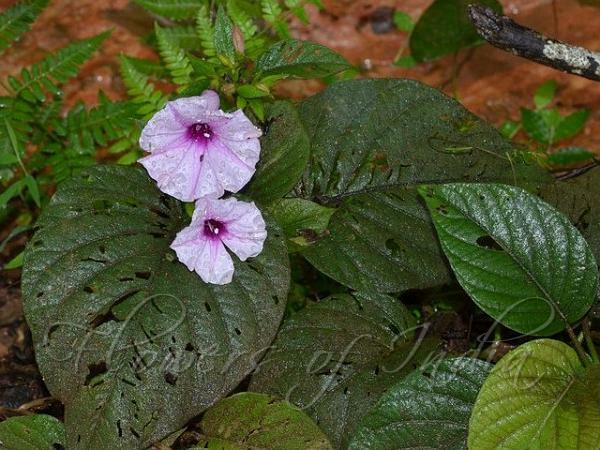 Hairy Morning Glory is found in South India and Sri Lanka. In India it is found in Kerala. Identification credit: Udayan Punakkal, Giby Kuriakose Photographed at Abbey Falls, Coorg, Karnataka.